film ick: Nicole Kidman's Handwriting? Mike Markus found the following poster for The Invasion, at least part directed by Oliver Hirschbiegel, possibly with a late substitution of the Wachowskis. 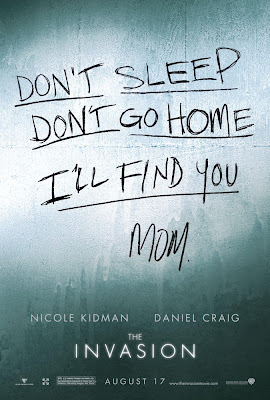 It looks like the plot either features a mother abandoning a child during a zombie-alien invasion, the child being taken away during said time or - and this is entirely possible, knowing the logic in films like this - a note written by a mother to the child she has already been seperated from even though she doesn't know where this child is. How is she going to deliver the note? Broadcast it on TV? It's hardly spoiler material then. But it does sound rather War of the Worlds, don't you think? And what are the odds on this being Nicole Kidman's real handwriting?